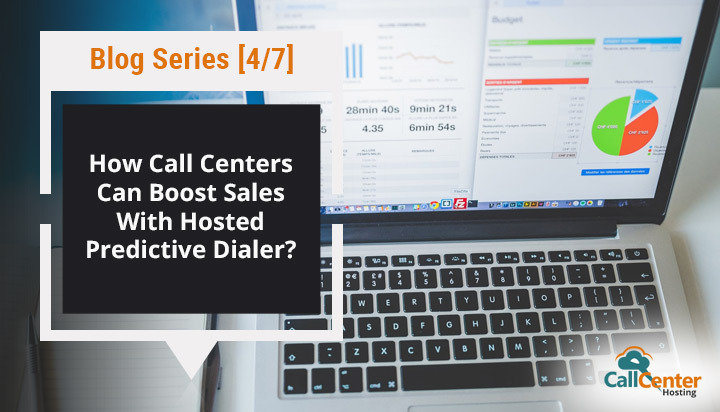 How Call Centers Boost Sales with Hosted Predictive Dialer? In the previous blog, we understood how predictive dialers help in managing the customer data effectively. And it’s clear that with the help of cloud technology, predictive dialers have brought in a significant difference to the number of customer connection. The capabilities of predictive dialers have overcome several limitations of the traditional call centers with the help of data analytics. The inferences from the customer data reduce the waiting time for the agents and connect with customers, quickly. And the reason behind it is the perfect timing of making the outbound calls so that the customer is most likely to answer it and eventually deliver more opportunities for productive business communication. A predictive dialer is fed with the leads and its dialing algorithms ensure of making the highest number of customer-agent connections possible. Higher the number of connection, higher the possibility of lead conversion. In this way, predictive dialers assuringly help in boosting the sales. Let’s look into it with more details of these algorithms and understand multitudes of gaining profits. A predictive dialer reduces the agent wait time and utilizes the agent availability to the fullest. They do not have to spend time on dialing the customers, checking up follow-up schedules, etc. By identifying voicemail, machine-answers, wrong, numbers, etc., it filters out the leads and connects with the agent only when the call is answered by a human. The predictive dialer speculates the possible time of availability of the agent and then it routes the calls, immediately. This leads to less idle time and more productivity from the agents. The predictive dialer is also helpful in maintaining the customer data with its easy CRM integration. So, all the relevant customer details remain available for the agent while making a communication that further leads to better customer retention. Also, every customer detail and history of conversation remain there in the CRM so that whenever a customer comes for a conversation, the agent has every needed information handy, such as – name, location and previous conversations etc. Comprehensive reports from the hosted predictive dialer help in making understanding the agent’s efficiency and business performance. For examples, with a few clicks, you can check the time spent by an agent on the call, how many agents are currently on the call, etc. Importantly, all these reports are updated in real time. With the help of such monitoring, individual skills of the agents can be used perfectly to guide your agents and make justified business decisions. Additionally, call recording feature is there too that helps in reviewing the etiquettes of agents while tackling with the customer queries. Another very important benefit of the hosted predictive dialer is the customer database stays updated automatically and agents carry the latest information about the customers while dealing with them. This practice helps in accelerating the sales because, with the help of already updated customer information, the agents get able to respond much better. For example, if a customer has shown his interest in one product and has declined the another then with this information handy, the agent will try to pitch him just one product. In this way, the agent gets able to do the right product sale. The algorithm that the predictive dialer uses rely on the agent’s availability so efficiently that every agent gets equal opportunity to speak with the customers. So with continuous interaction with the customers, the agents get to understand various scenarios to make a better sales. So, we get a highly efficient agent force that has every individual agent can deal with customer queries with the best of their potential. The predictive dialers are highly adaptable as well in different scenarios and with its intelligent features, it can be scaled up and down, accordingly. For example, for a small and medium business, it is essential to be to approach the customers with a specific goal. And for a business that has spread across many continents, it is essential to throw the outbound calls at the right time when the customers are most likely to take the call. Hosted predictive dialers just make sure about this by using the algorithm. This technology helps in blending the inbound and outbound calls together from the same portal. The automatic call distribution system works accordingly to deploy the agents for the inbound as well as the outbound calls. This makes it a one-stop solution for both the inbound and outbound calls and it gets much easier to assign the agents. The algorithm of predictive dialers efficiently uses the agent availability and makes sure that the agents stay most occupied. And accelerating the sales process is all about making the result oriented communication with the customers, this idea is immensely supported by predictive dialers. In the next blog of this blog series, we will see how predictive dialers help in saving time and money in call center environment. Subscribe to our blogs to get an update. Predictive dialer helping in handling both inbound and outbound calls help in saving a lot of time for the call center agents. This feature makes it a must use technology in today’s call center environment. Really liked this blog. Especially the pointer where it is mentioned that a predictive dialer can mold itself according to the business requirements. This use helps in saving cost in the call center. Monitoring agents’ performance with the help of predictive dialer is an added advantage. Indeed predictive dialer has the capability of managing all the call center needs.